The llamas are hopping again…or should I say creepy crawling? This Fall we are having a fun peek at what you can do with your Stampin’ Up stuff to add to the fun of the Fall Holidays. We’re focusing especially on the new product from the Holiday Catalog. If you haven’t seen that yet check with your demonstrator or click on the digital version available in the side bar of most of our blogs. Okay…First up…Halloween! We considered Labor Day…but really…did you want video’s of us laboring? Nope…so here we are with fun, fall, creepy and downright weird entries for your enjoyment. If you get lost somewhere along the way (Haunted Houses have that effect you know!) click on the Banner or Home button on any page to find your way back to the Hop’s home page and there you will find all the blog links you need to get you back on track. With luck you’ve arrived from the talented Miss Jackie’s blog post that has you shivering with delight and ready to curl up with a couple of cats for company! My first project set is a dual one – the card was designed and shared with me by my friend, neighbor and fellow demo Linda Miller. 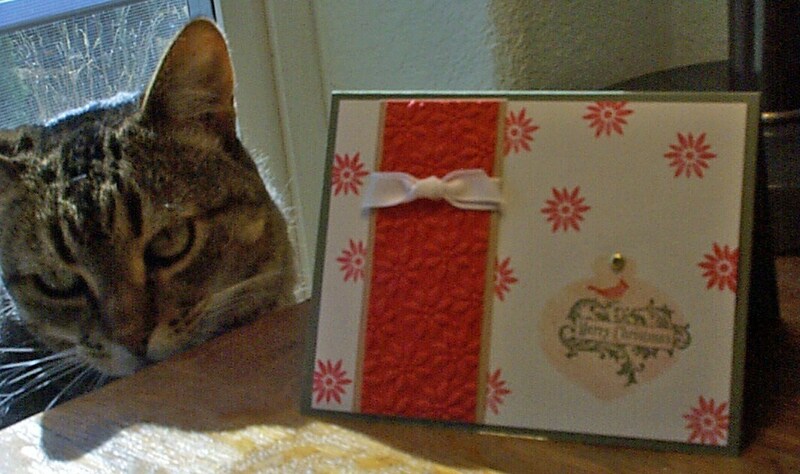 Using our new Frightening Feline single stamp from the Holiday Catalog. I just knew I had to include this in the hop. After all…you know me and cats right? And who can resist a little feline with googlie eyes and nicknamed Boo! 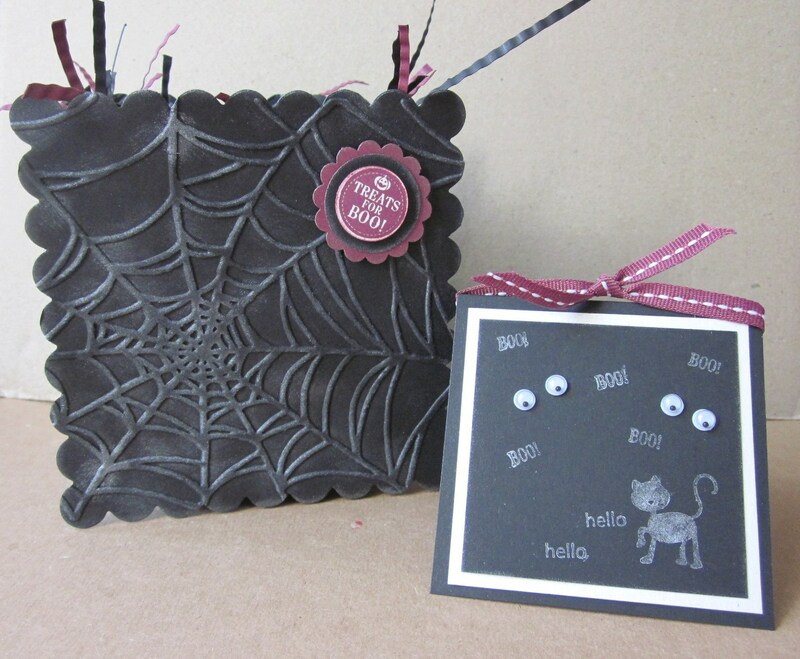 The little Box next to it is my own Boo Bat Box that’s perfect for a collection of treats, cookies or a collection of small cards like the little one in the second project set. I love the holiday coverage of the new hostess set Mixed Medly. There is something there for every season and occasion of the year. 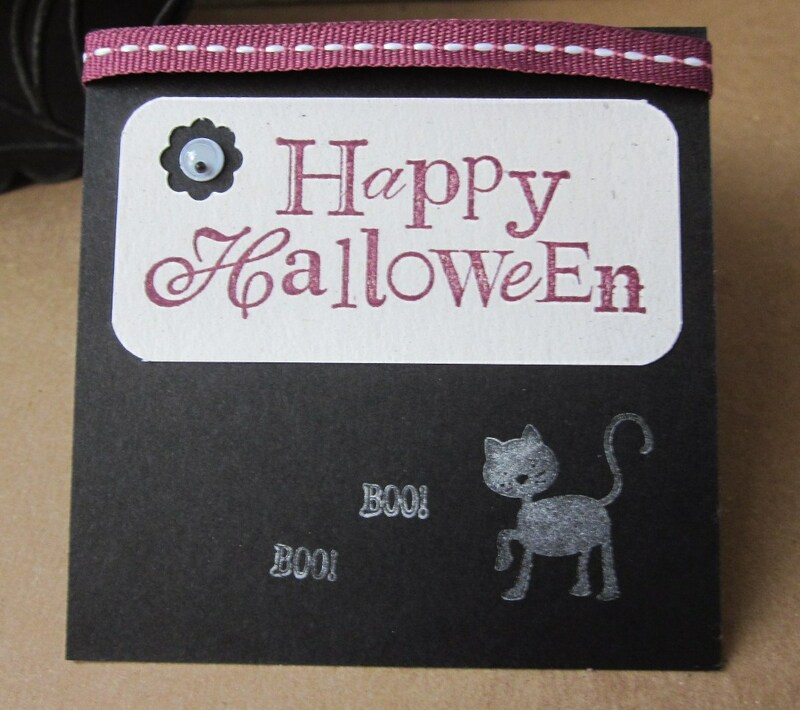 This first card will have you shimmering with feline fear…well…fear only if you are out of treats for your little boo! Dedicated to my once and still loved all black cat Taz (short for Tasmanian Devil) from decades ago. She had a wicked sense of humor, a love of treats and crazy, of all things, for playing in and with water. She played in sprinkers as well as joining me in the shower! And along with all my other cats loved to lick up spiders and spider webs as a tasty treat. Her version of cotton candy! So what could be more perfect than combining a black cat with a web waiting to be eaten! Quick note…if you too have an all black (or even mostly black) cat….keep them indoors for Halloween including a day or two on either side. It’s for their own safety…and will make them easier to find in a well lit house to boot! 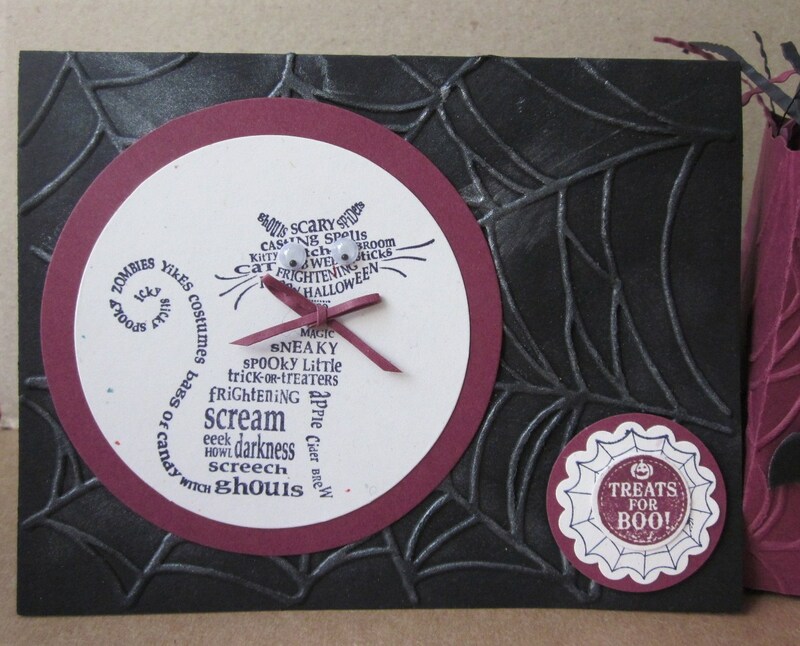 Stamp Sets: Mixed Medley (Holiday Catalog hostess set), Frightening Feline (128105 W), Delightful Dozen (122652 C). For an alternate look you can substitute the new Illuminate Glimmer Ink in place of the Frost White Shimmer Paint. And if your fingers aren’t nimble enough for paper shred bows you can substitute narrow taffeta ribbon. I left this box plain without shimmering the spider web just for simplicity sake. It took 4 passes through the big shot to get the box entirely covered with the webs on all sides. Emboss the die cut box before assembling with Sticky Strip. Next up is a project that’s been floating around in my head for years and is dedicated to Sandycat. 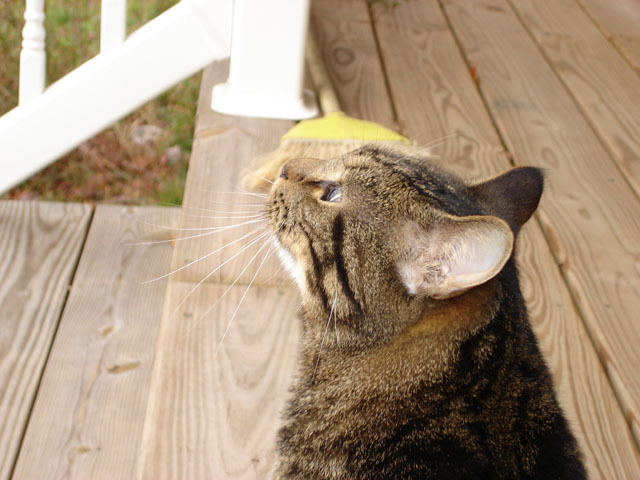 My beloved feral feline who along with Wicketcat is now treading the rainbow bridge with all my others. This 3″x3″ card is from Sandy’s perspective for when she got locked in the garage and desparately wanted back in to the well lit house! She could be one frightening feral feline who was frightened herself of the dark! The rest of the time she was a “pussycat” in every sense of the word! If you wanted her out of the garage (or any other room for that matter) all you had to do was turn out the lights and she’d scoot right out. For years the house was filled with night lites to keep her happy. 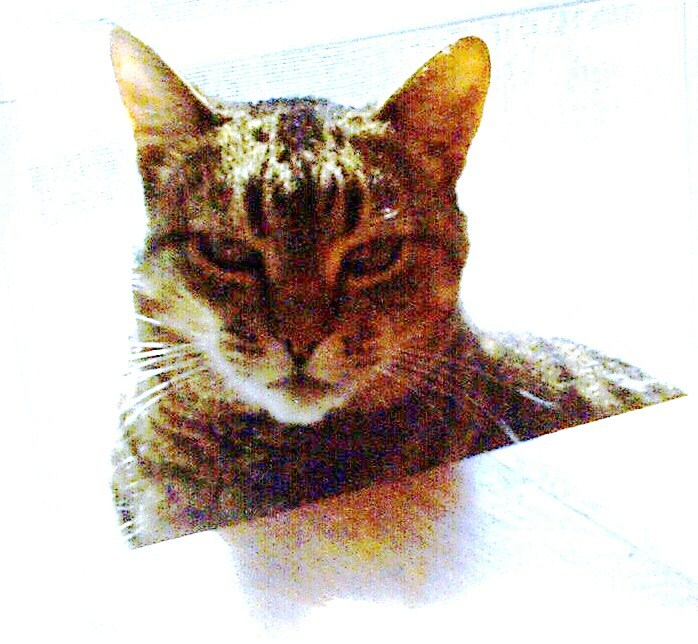 So here’s Sandy sitting in the dark and obviously not very happy about it! You could make a set and place them in the Razzleberry Boo Bat Box up above. 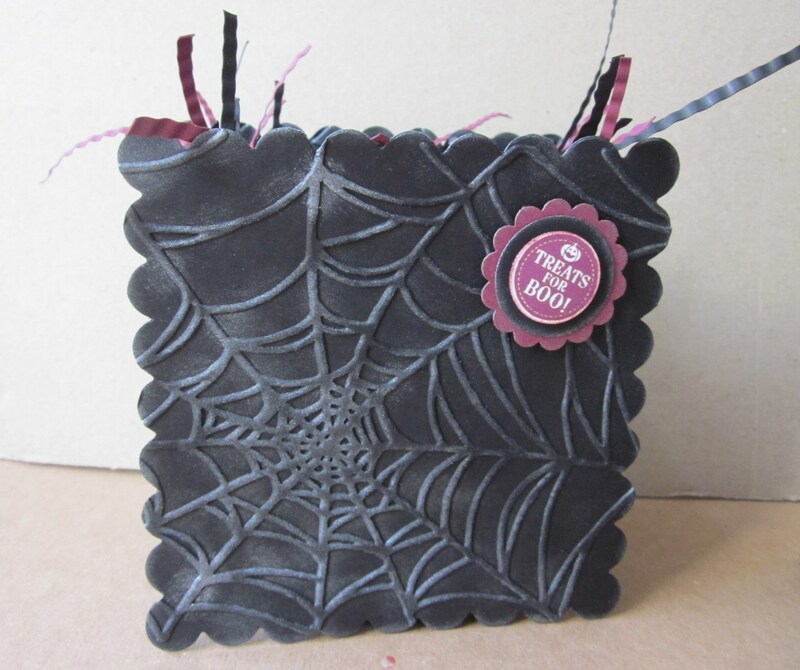 To make her feel better I paired her card with a Scallop Square “Treats for Boo” Box. Like all my cats Sandy loved webs like kids love cotton candy! 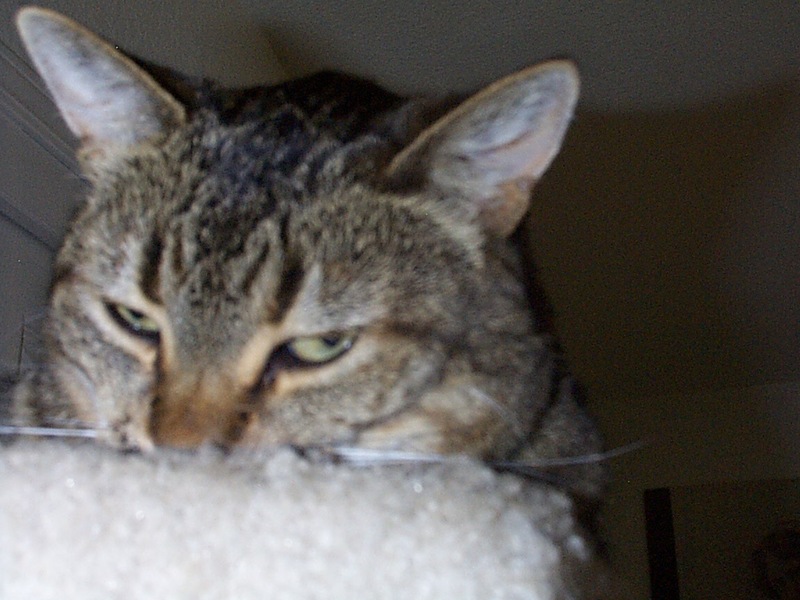 And Boo just happened to be her pet nickname (well really…all my cats got called Boo at one time or another but Sandy was the one who proclaimed it her own and would let me know it wasn’t to be shared with Wicket or any other cat in the vicinity). I had fun once more with the Googlie eyes and the new Holiday Catalog featured Illuminate Glimmer Ink. And if you are looking through the catalog for that little black cat image…you won’t find it! I know that’s the trick part of this trick or treat hop! Seriously though…check with your demonstrator and ask her about the new Fall Incentive Stamps. 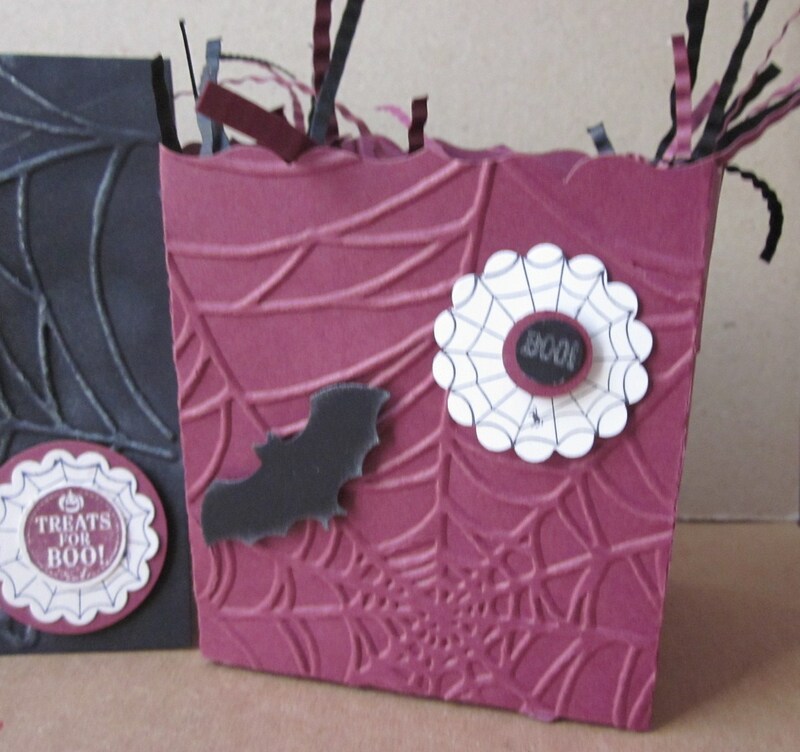 Stampin’ Up offers special sets of single stamps for demonstrators to use as rewards, incentives, gifts, etc. And this little kitty is one of them. 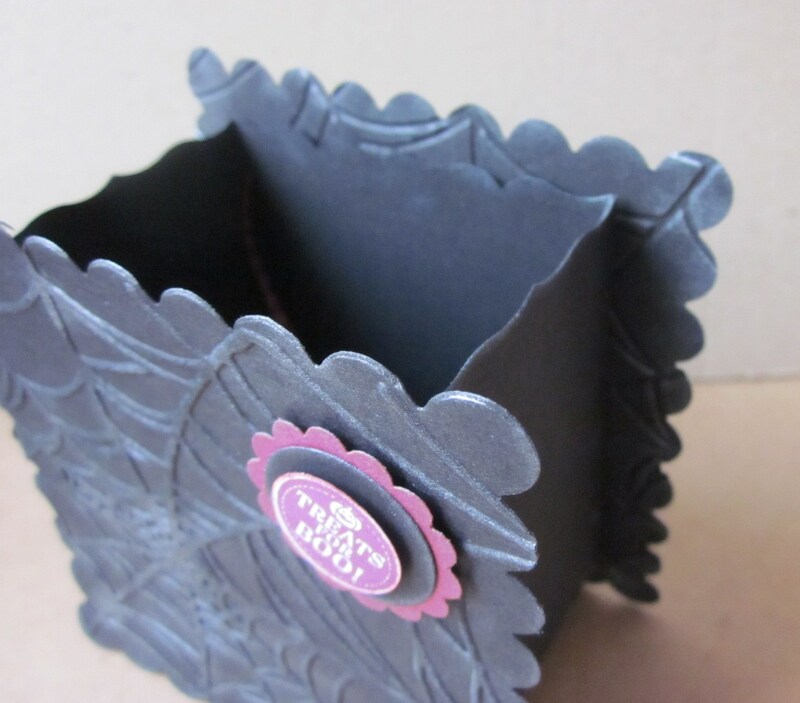 Box is made with a Fancy Favor Box sandwiched between two Scallop Square Die cuts. Scallop Squares are run through the Spider Web Embossing Folder and daubed with the Illuminate Glimmer Ink. Thanks for sharing my quick projects for those treats for neighbors, coworkers or for special goblins and gouls that come to call. Next stop on our Falliday Hop is Miss Stephanie’s wonderful blog. Click the link or the Next button down below. Make your selection carefully…one never knows what ghostly riders might join you! 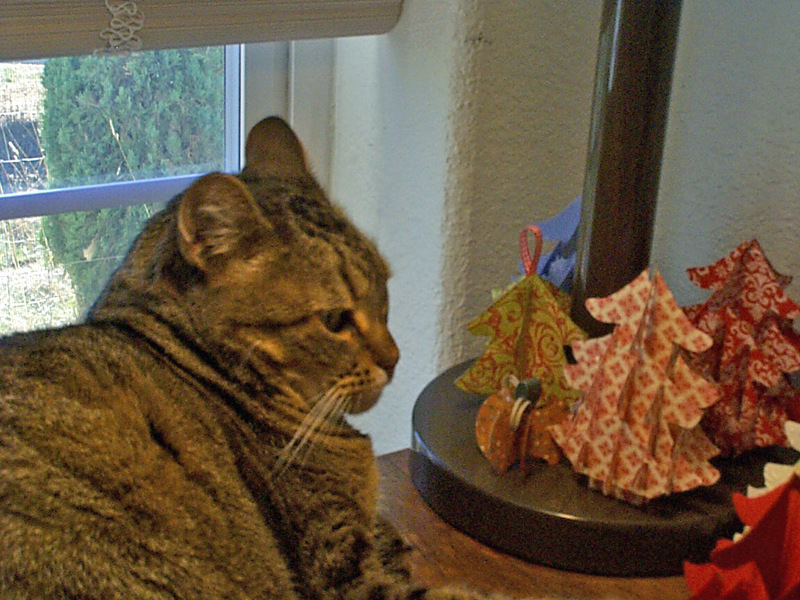 Silent night…Holy night….and then the cat started in. Merry Christmas Aftermath my friends! I hope your Christmas was filled with family, friends and fun…lots of fun. Because now its the day after Christmas and the aftermath must be faced…will you leave the tree up until New Years or maybe Valentines? All depends on your family traditions and grasp on the finer points of procrastination….LOL! Will you join the shopping crazies in search of more and better deals….either for themselves or to get a jump on next years Christmas…yup I used to be one of those. No sooner were the gifts unwrapped than I started planning for next year! Crazy huh? 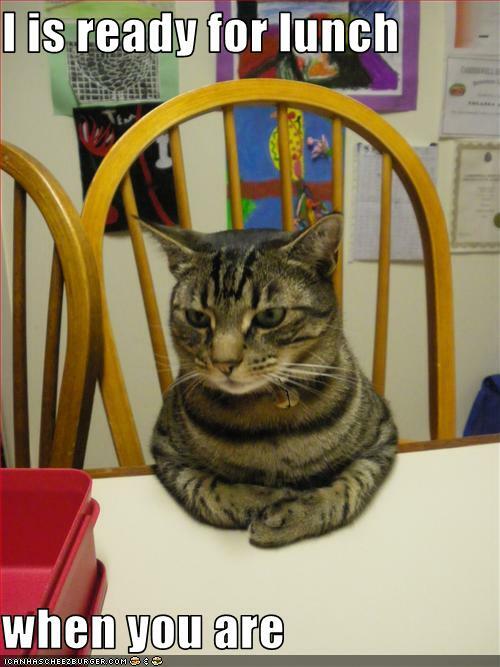 Are there dishes waiting for you? Ornaments to clean up? Wrapping paper to decide…add to the stash for crafting or toss or “shudder” burn (really bad for you, your chimney flue and the environment unless it’s all Stampin’ Up brown wrapping paper). As I said the Aftermath….hmm…almost sounds like a nuclear attack doesn’t it? If you have kids chances are there are degrees of similarity. I’m grinning now as I type this but let me tell you Christmas Eve at my house was anything but silent! Not too sure about holy either as my nerves frayed and my language…well…it slipped…lets leave it at that. Sigh…something else to remember next time I go to confession! I wonder if I can take Wicket with me so the priest will understand the provocation. This year there were missing faces at our families Christmas tables that reflected this year as a year of loss in many ways. Apart from the separations that come the way of many families, the face missing most was that of my Mother in law who died last January. She was responsible for so many years in making our family Christmas and in keeping us all in touch with one another as we are now more scattered than ever before. 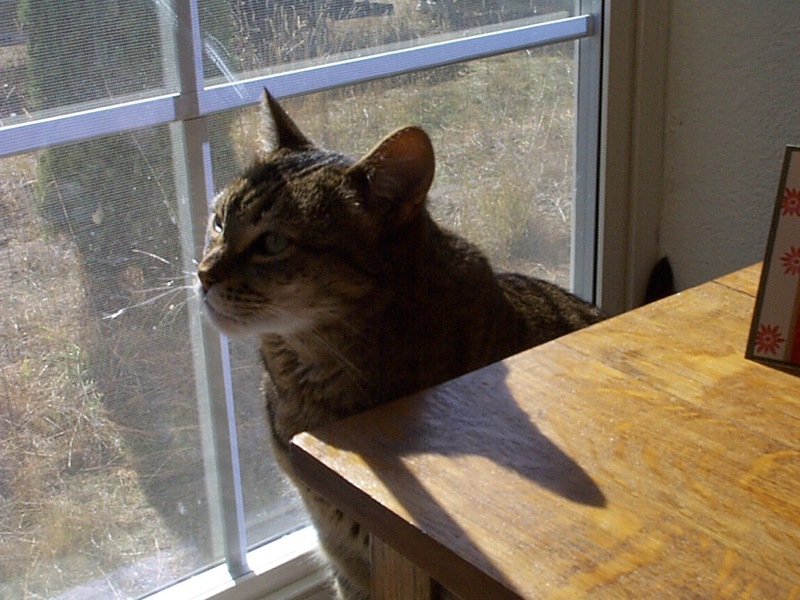 At my own hearth the missing face (besides my extended family who are mostly in California these days) was my beloved Sandycat of the mechanical paw and loving heart. Her ability to share love while maintaining her wild nature was amazing. Add to that a torn rotator cuff and a small stroke of mine and as I said aftermath seems to have been a theme. On the other hand the year has had its flashes of joy, periods of inspiration and creativity and additions to my kitchen table and cyber table of friends and fellow crafting comrades from here and my various online communities. Friendships that began over blog post comments more than a year ago have blossomed into phone calls, shared packages and letters and plans to meet at SU convention or on vacations that cross paths so we can get to know each other even more. Grown into lots more hours on the computer too but that is yet again an aftermath…and one I’m happy to live with…though I’m betting it’s going to lead to even more Wicket fits that lead to fewer silent nights…and so the cycle will probably continue. Loss, pain, joy, growth as the circle continues. Check back next year to see if Silent and Holy made it back on the agenda…okay? All of this brought to mind a quote about grace and holiness and growth from a favorite mystery book that I came across as I was hunting through my archives on my drive for something else. Also put me in mind of a Christmas miracle from the past I shared on a friends blog last year that also, as so much of my life does, involved a cat. No one is ever far from grace. What we’re too often far from is willingness to open our self to grace. From willingness to let grace come to us. We keep our minds between it and our hearts. As for our becoming holy…… I don’t think we have to become “holy” to succeed in our life here. I’m not even certain what “holy” would be for us. Dame Johane in response – “Dame Thomasine…” Dame Frevisse responds – Yes , but it seems more a gift given to her than something she became. I haven’t been given it. I know that. 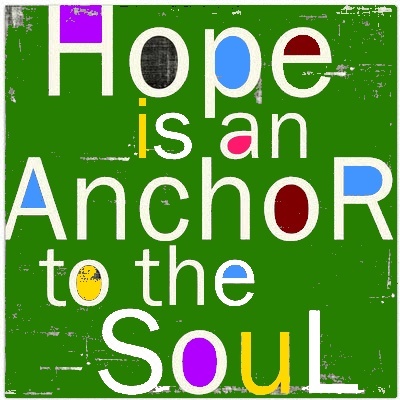 My hope isn’t for holiness, only that I grow enough–can set my roots of faith and belief and love deep enough–that like a deep rooted plant growing taller than a shallow rooted one, I finally come as near God in my mind and soul and heart as I can, no matter how much in the world my body has to be. Dame Frevisse speaking to Dame Johane in Margaret Frazer’s “The Apostate’s Tale” pg 124-125 A medieval mystery tale in a Nun’s Convent at the time of Chaucer. The first of many…I live my life by miracles or so it often seems. Some large and indisputably Miraculous… when your husband is dying and you live in a small town wouldn’t you love to end up at the one hospital where the surgeon on duty just returned from a conference with the worlds leading specialists on that specific problem and can make a few phone calls that end up saving your DH’s life! Add to that all the right techs being in the hospital on a weekend so all tests can be completed in 45 minutes or less (talk about a Golden Hour)! And that’s the basic story of a big one. Then again, some days finding a parking spot right in front of where you are going counts as a miracle in my book. But…you asked for a Christmas Miracle…and those should be special and mysterious and perfect just like the first Christmas itself! On the first Christmas Eve after my husband Steve and I were married in 1981… we were sad that our Abigail (Abbycat) cat had disappeared and not returned home for quite some time so no little kitty paws to go pitty pat through the house, looking for that stirring creature – a mouse. Still, we looked forward to Midnight Mass and leading our parish community in worship and song (gotta love that hour of Carols in a darkened Church), so we tuned our guitars and crossed the street (yes we were lucky enough to rent a cottage across the street from our parish – another of those miracles – lol)…and sang out our Christmas Joy at Christ’s birth with our brothers and sisters. Halfway through the service I glanced out the open Church door and saw a sweet little cat swaying to the music but looking just a bit unsure of a welcome. She followed the whole service from that doorway hiding only when people started to leave. As we left the Church, I stopped to pet the sweet little thing (who had popped out of hiding thinking everyone had gone) and wished her a Merry Christmas. As we started for home, we heard the patter of little paws following us from a distance. And, every time we stopped to listen the paws stopped too! 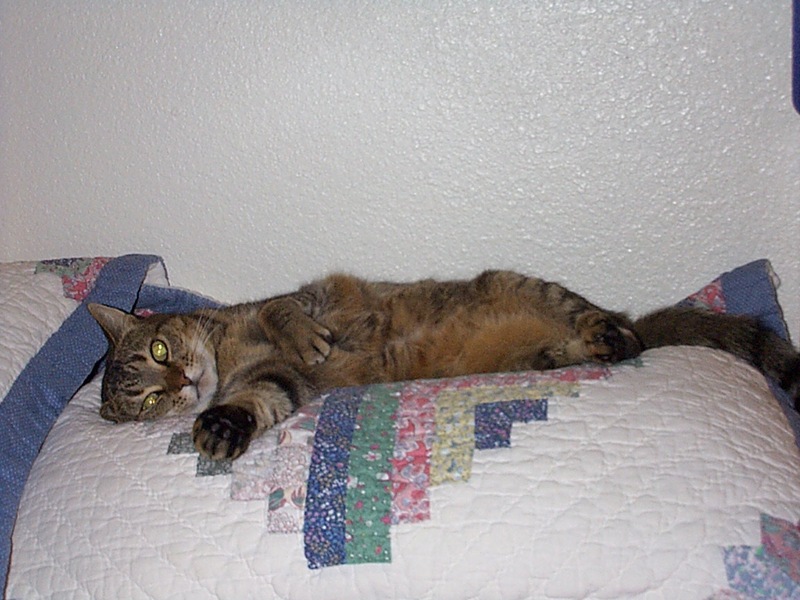 Once home, we discovered that we had a friend…so thinking perhaps she was a stray looking for room at the Inn we welcomed her with food and a bed (though she had to be coaxed and convinced it was safe). So once again, God provided not only our needs but our wants as well and we had a Christmas kitty for life! As we found out later she needed us just as much as we needed her…She’d been abandoned on the steps of the rectory some time earlier and crept out to eat leavings from the Scout’s at the Church’s Christmas tree lot until the lot was struck Christmas Eve – with no home left God provided her need and our want. We also found out later that she had suffered neurological damage (a bit like mine) from early trauma so had a few funny quirks (she couldn’t climb or walk a straight line for years). She was ever after a Church cat. We were the unofficial sextons for the Church and would lock up after every event and make sure that all was in order. We always made that part of an evening walk before bed and our little cat, Juano, followed us everywhere as if she was a dog, even if we went for a mile or more around the block! She loved to escape into the Church and play hide and seek in the pews kneelers. We would come back from turning off the lights and find her gazing and swaying (praying?) in the candle light before the side altar or, sitting up straight and tall in the Presider’s chair for all the world as if she was about to begin a prayer service! She also spent every afternoon at the Church’s School during recess and in the library after school until closing. So many lovely memories and even more miracles but that’s a story for another time. God loves us enough to give us not only what we need but often what we want – wrapped up with all the trimmings if we only take the time to look for the miracle. May you always have, paw prints on your heart and soul (After all little one’s adore Him too! ), and miracles every day of your life! Aftermath has so many meanings and consequences doesn’t it? Ah well maybe next year Silent Night will return to its traditional meaning and have a chance to become Holy! Do you think there were cats in Bethlehem on that first Christmas? At least the Shepherds only had to deal with sheep and angels….just saying……. One last thing I wanted to share that I came across in my surfing…a modern day’s take on that first Christmas if social networking had meant then what it does now. Enjoy! May your Sunday be blessed and your aftermath one of joy and growth with a little silence and holiness thrown in. So many of you have written or left comments or sent lovely cards to keep my spirits up I thought I should let you know…. After a struggle of several weeks Sandycat finally was in such bad shape I had to take her into the vets to begin the long sleep just over a week ago. Hard as that decision was I couldn’t let her continue to suffer and slowly starve to death as her liver shut down. I brought her home after and buried her in the back pasture between two pine tree’s and plan to plant a bush of some kind there to mark the spot (If any of you Pacific Northwesterners or those familiar with our climate and soil have ideas as to what I should plant I’d love some ideas). Sandy’s beloved horses were there in the neighboring pasture watching and sharing the sad time. Can’t remember when or if I last shared Sandy’s horse story…. I’m so grateful to my friend Cheryl who went with me to the vet and when my strength gave out came and finished digging Sandy’s grave for me. The back pasture had a lot more clay than I expected and digging mostly one handed was a major chore so the help was truly needed and appreciated. Good Friends are truly a blessing. I’ve been so grateful for all your caring notes and cards and emails. Grateful too for the quiet time the last couple of weeks spent cuddling with Sandy. I was so surprised at the trust she showed. Most cats when they are very ill or hurt will crawl away and hide and she never did, she just wanted me to hang out in bed with her and keep her company. Turn about seemed only fair given the number of hours she and Wicket have spent with me as I recover from seizures, etc. In true Sandycat fashion though she did manage to waft her way through seemingly closed doors and windows. The number of times I found her outside or on the other side of a door with no memory of letting her out was amazing. Somehow she managed it though! Rather like ants and their seeming “transporter” technology. Another odd occurrence was the night before the last scheduled vet visit. I was dreading the following morning and not expecting to get much sleep…. I had just gone to bed though not yet asleep and was laying there with my eyes closed waiting for sleep when I suddenly started “seeing” all kinds of cats. Lions, tigers, pumas and various kinds of wild cats as well as a few domestics. Very intense like they were some kind of spirit cats – seeming more than just real, but see through, and then one appeared that I just knew was Sandy though larger, more lynx looking but with her color markings. This cat slowly turned to look at me and I had a sense that this was Sandy’s true nature and that she wanted me to know that she would be fine. An amazing experience and I only wish I was enough of an artist to reproduce the gathering of cats. Though different in some respects it made me think of some Sci Fi or Fantasy stories I’ve read in the past. My Navajo sister in law would say it was a spirit walk for both myself and Sandy and in fact from what I’ve read about such things or experienced in the past that’s very much what it felt like. I wonder what Fr. Liam will have to say about that one if I ever get up the nerve to tell him! So now Wicket is an only cat and we are both adjusting. I had hoped she would end up settling down as the undisputed queen cat of the roost but it’s looking like she is more in need of feline companionship than I expected. Will have to think about that one. It takes a bit of doing to integrate a new companion animal into a household and I’m not sure I’m up for the work. She spent the first few days screaming and scolding. She’d become the ubiquitous fishwife instead of the cuddle cat I expected would appear (her usual reaction when Sandy was boarded) – and had me wondering if she has some Siamese DNA in the mix after all. Maybe she liked being picked on by Sandy? She’d spend hours sitting by my knee and patting me with her claws out and crying but I couldn’t figure out what she wanted. Thankfully she’s now slowly calming down and we are figuring out our new roles. Two crotchety old ladies is what we seem like as we redefine our territories and pecking order. Slowly she’s getting the idea that if she shows me what she wants we’ll both get on better and I’m learning to spend a bit more time than usual petting and playing. Funny that she seems to sleep so much less now. Wicket turns 15 in another couple of weeks and that in itself is amazing. Most of my cats haven’t lived past 6 or 8. She’s had some close calls but is amazingly healthy. In fact some days she won’t stop running up and down the hallway in a mad steeplechase of one! She’s also taken over Sandy’s appetite or so it seems. The running is building up her muscles and the eating has put a few needed pounds on an always too thin frame. Time will tell and as always with cats…it should be interesting! That’s it for this weeks Sunday share and hopefully I’ll be finding out new and more fun facts to share with you all about all the new SU announcements in the coming week. Hope all of you are enjoying Spring and finding joy in your lives to counterbalance any of the not so fun stuff that seems to find its way into every life this side of Heaven. Hug the ones you love my friend and save a few for those most in need of them – after all hugs never expire right – lol! There may be a few look alikes and Sandycat imitators out there but she was a one of a kind cat who was convinced she was as much human as cat. A mechanical marvel who was always learning and experimenting with a purpose and a communicator without peer. I hope God has a lot of catnip stored up…he’s going to need it to keep her happy(wouldn’t hurt if Heaven has a few dead bolts and light switches, phones and TV’s either to keep her occupied)! Sandycat is Keeping an Eye on You! I just wanted to let you know I’ll be taking most of this week off (and maybe a bit more) from blogging. Sandycat, my darling kitty I’ve shared stories and pictures with you in days past, is very ill and not likely to survive much longer so I’m trying to spend as much time cuddled with her as possible and to make her as comfortable as possible. She’s still being funny and sweet right up to the end. As I shared with my newsletter readers a couple of weeks ago…. Sadly life had gone from that to (also from my newsletter)…. I’m afraid this listing is just a bit on the short side this week. Besides increasing seizures of my own my Sandycat has taken a turn for the worse and it’s looking like she won’t be with me much longer so I’ve been trying to spend more time with her as cuddling and sleeping seems to be mostly what she’s up for. A few weeks ago she started throwing up more than usual but otherwise seemed fine so I figured she had gotten into something and just needed to work it out of her system as has happened in the past and then just in the last week or 10 days she slowly stopped eating. Her spirits are still basically good though a tad grumpy and she’s able to drink some water but she’s dropped over half of her previous 15 pound weight and is getting weaker and weaker. After almost 10 years together it’s hard facing the idea of losing her. More than any of my other furry friends over the years we are something of alter ego’s for each other though some might say she’s picked up some of her craziness from me I of course contend that it’s just the opposite – lol. She’s also probably one of the smartest and most interesting cats I’ve known. Very mechanical and interested in people stuff in unusual ways and very expressive. I’m never in doubt about what’s on her mind. If I can’t read her mind she’s very good at showing or acting out what it is she needs. She’d have made a fortune on Drew Cary’s show doing charades! Though a feral cat by birth we’ve been housemates and heartmates since she was 7 weeks old and for a feral she’s quite domesticated. Unlike most cats she’s mastered the art of compromise – an amazing trait all on its own! Though Wicket will still be with me, and of the two she’s a wonderful little nurse cat who watches over me very carefully, my heart is already breaking at the idea of loosing my naptime buddy who’s willing to let me be me and who manages to make each day fun and funny. I’m not sure if I’m going to be up to getting a newsletter out this week so there may be a short hiatus. I’ll try to keep it brief and get back to collecting goodies as I’m able. Blog posts may be a bit light as well. Well that’s the “skinny” as they say (yeah I know bad pun…but as I learned on the Cancer Ward what else is a girl to do if she’s not going to sit and cry) and I’ll be back sometime soon. Thanks to all of you who’ve been kind enough to write, email or call. Your encouragement has meant a lot! P.S. Though I won’t be blogging for a bit I’ll still be able to help you with any orders or questions you might have or you can place your orders directly through my online Stampin’ Up! store. Just click on the icon in the upper right corner or send me an email or call and I’ll get it done for you. 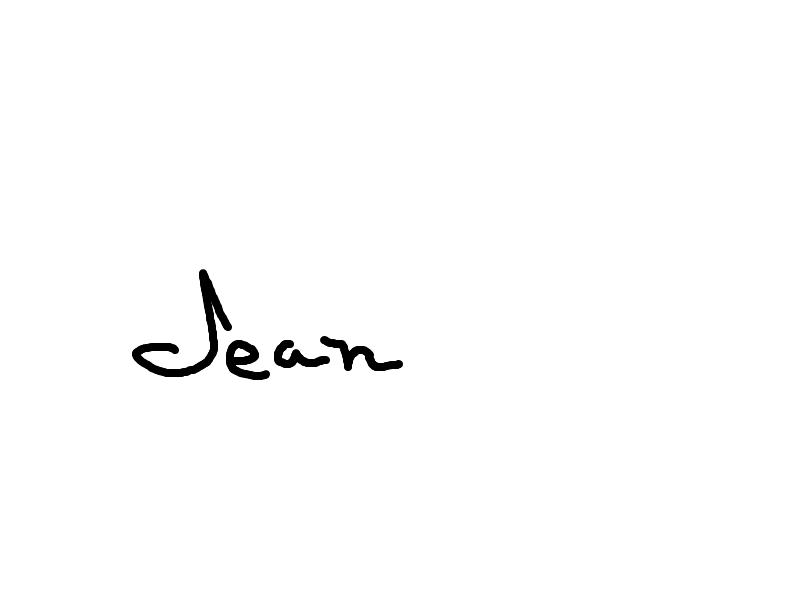 Hugs – J. What will that crazy cat decide to like next? Bells! Yup, Sandycat is bellstruck (sounds like there might be a bell related pun in that last bit). I was surfing about looking for the text/lyrics for O Christmas Tree – not too surprising given all the trees I’ve been making – when I came across a site with MP3 files of church bells and guess who was fascinated. Yup, Miss Whiskers herself! Certain files brought forth ginormous purrs, icks and a dazed expression. Others brought looks of consternation and flicking ears. The one that seemed to be most requested for replay by her majesty was a beautiful version of All Things Bright and Beautiful. Do you think she knew the rest of the quote…All things bright and beautiful…all creatures great and small…all things wise and wonderful…the Lord God made them all. Or was she influenced by the DVD’s of the old BBC series All Creatures Great and Small about vet James Herriot. Got me thinking so I had to Google the full text of this lovely hymn and thought I would share it with you. Somehow living in the country as I do these words have even more meaning for me. Especially with all the rivers and hills that surround and run through my little pocket of heaven that is the Rogue Valley and the Applegate in particular that sits right at my doorstep. This seems to have been a week for hymns and carols for some reason. Maybe because of all the creativity that’s been happening here and all the Christmas ideas percolating through the design mind. As those of you that follow my blog know I’ve been going stencil crazy and for some reason stencils and Christmas just go together for me. Maybe because my mom used to let me stencil Holiday images on the house windows when I was a kid. Didn’t have much in the way of drawing talent back then (still don’t for that matter) so stencils were my best friends when it came to artwork. Well that and potato stamps. I loved carving up potatoes or using metal cookie cutters on them and then scooping out the interior space for a perfect stamp – star images were my favorites. Add ink and Voila! Just don’t leave the potatoes sitting around in dark or out of the way places – trust me you don’t want to know what happens to them. I hope you’ve all had a fun and relaxing weekend as we begin the long coast into Thanksgiving and Christmas. Amazing that just yesterday it was July and I was complaining about the heat and now my poor old bones are feeling the cold and I’m praying for sunshine most days. Hmm…guess I’m just never satisfied with what God sends…I’ll have to work on that…after all there is a time, a reason and a season under Heaven for all things. Nope not a quote just my own odd paraphrase of a couple of familiar sentiments. May blessings, hugs and lots of stamping love fill your lives this coming week and warm your heart and soul. Rogue Musings with a Cat on the desk! My desk has been taken hostage! Not Sandycat or my desk but read on and you’ll get the idea! Okay I’m back. The good thing about Sandy in a hissy fit is she really can’t stand the tension so eventually she breaks off runs away and hides until she can sleep it off. Very tiring defending your turf from cats who don’t know you exist! So now should I mention the kittens I just found under my deck last week? How does one explain to the home buyer I hope will be buying my house PDQ that no I wasn’t a cruel hearted – – – who just moved away and abandoned her cats! The cats actually belong to the neighbors but for some reason Mama cat along with the rest of the neighborhood of animals have adopted the underneath parts of my deck as their home away from home. So have the skunks and therein lies a tale. The last two weeks I’ve noticed regular and frequent short duration whiffs of eau de skunk. Not a big deal to me as it just smells like bad garlic but I’ve been trying to figure out why there seems to be so much more of it but only in little doses. Enter the discovery of the kittens. Ah ha something tells me that now that the kittens are a wee bit bigger they must be exploring the skunks territory at the end of the deck and perhaps making themselves just a little too much at home. Kids do have a way of doing that don’t they?? Now while skunk and family seem to have decided my Sandycat is okay as a neighbor who doesn’t get too pushy but stops by for the occasional chat they seem to object to child invasions of the four foot variety. Hmmm…how to phrase this in the disclosure agreement without sounding like a loonie toon! Dear buyer your lovely new home comes complete with animal companions of all species….Good luck… might be the most honest way but it sure would be fun to do a riff on the space they have unknowingly sublet to little seen but occasionally noticable tenants. And do you think I have an obligation to mention the bobcat that will most likely be showing up in another month or so that likes to hang out on the roof? All these critters haven’t caused any problems and actually are kind of fun to watch but I can see how some people might not take it quite so calmly. Picture new owner in the kitchen washing up after dinner and glancing up at the skylight and seeing…….oh my I do live in the country don’t I! So….Saturday was stamp camp in my Living Room! Lots of fun and a wee more informal than when my partners Cheryl and Linda and I hold them at Linda’s Church’s Hall. Slightly smaller group so we were a tad more leisurely in our crafting and took time for a bit more visiting. Seriously fun projects! And lots of chocoloate. Missy one of our customers brought hand dipped chocolate covered strawberries! Now that’s what I call a wonderful customer! Lots of other chocolate truffles, peanut chocoloate mix and…..oh yeah we had some real food too! I don’t often get a chance to stamp myself at Stamp Camp so yesterday was very fun. Nothing like getting the fingers nice and inky. I’ll be posting the projects Monday so you can all enjoy the inspiration. 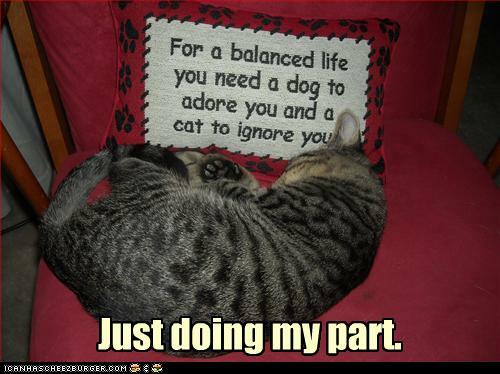 Funny cat note about the day. Obviously since the night before I was in a whirlwind of cleaning as well as pushing all the furniture against the wall to make room for tables and chairs the cats figured out that something was up. Nice fur mama that I am I moved their bowls and potty box into the Master bath figuring Wicket and Sandy would be spending the day under the bed. Well part way through Stamp Camp Wicket decided to join the party but kept meowing her NoW sound and her stress sound and I couldn’t figure out what was up. Turned out later that what was up was Sandy was missing! Usually the two rascals call a truce and cuddle up together for support when strangers invade the house and Wickets bud was no where to be found thus the crying! After everyone left I started looking and calling and couldn’t find Sandy anywhere. Then the light above the head went off and I checked outside. My dear girl who lately hates to go outside had spent the day under the deck and hiding in the bushes! And boy did I hear about it. After a few mournful mews the kitty swearing began! And Sandy, feral kitty that she is, can cuss a blue streak in CAT! On the upside both cats are really enjoying the big open space with the furniture all to the sides so to make it up to them I’m leaving the open area for a day or so and now they are holding steeplechase races with timeouts for long sensous rolls all over and up and down the carpet – sorta swimming a side stroke all around the pool (carpet). I’ll see if I can get some pictures of the action later today! One last Oops on my part for the day. I had gone to bed and Sandy was crying at the bedroom door and wouldn’t stop. Turns out I forgot to put her “living room” big dog bed full cat body pillow back out from where I hid it from view for the day! The living room still had that big rug space, her cat tower and a couch with a faux fur sheepskin type piece on the couch but what was missing was the pillow! Boy are they spoiled! But hey when they sound that pitiful and you just know their heart is breaking and besides she got locked out and of course that was my fault (though how she got outside without any help from me was left out of the discussion…….)…. what’s a fur mama to do….get out of bed and get the pillow out of course! And here I thought I was in charge!